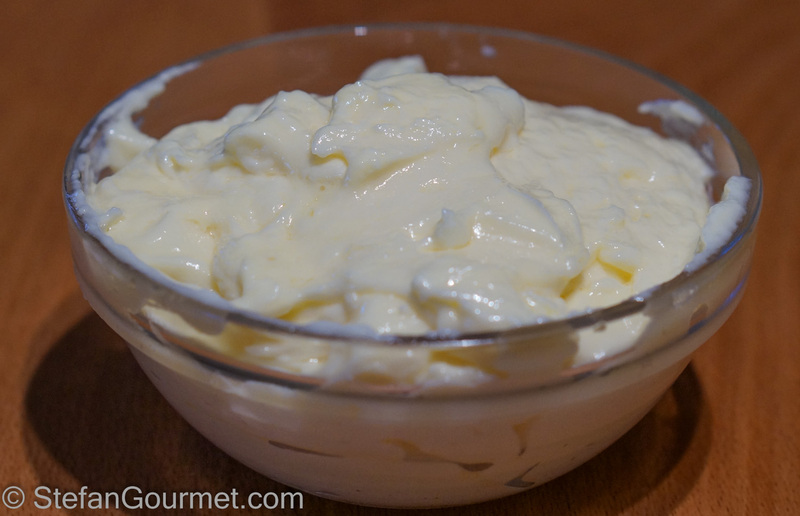 Aioli (Catalan) or Alioli (Spanish) is the Spanish version of mayonnaise with garlic instead of mustard. It is served with various tapas. Traditionally it is made with pestle and mortar and a whisk, but a blender does a pretty good job, too. The preparation is very similar to that of regular mayonnaise. 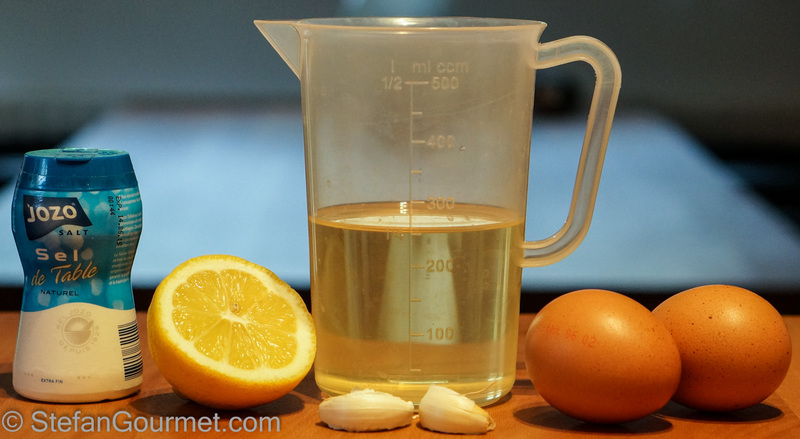 Key to successful homemade aioli are oil and egg yolks at the same temperature and patience. It goes without saying that homemade aioli is much better than anything that comes out of a jar. 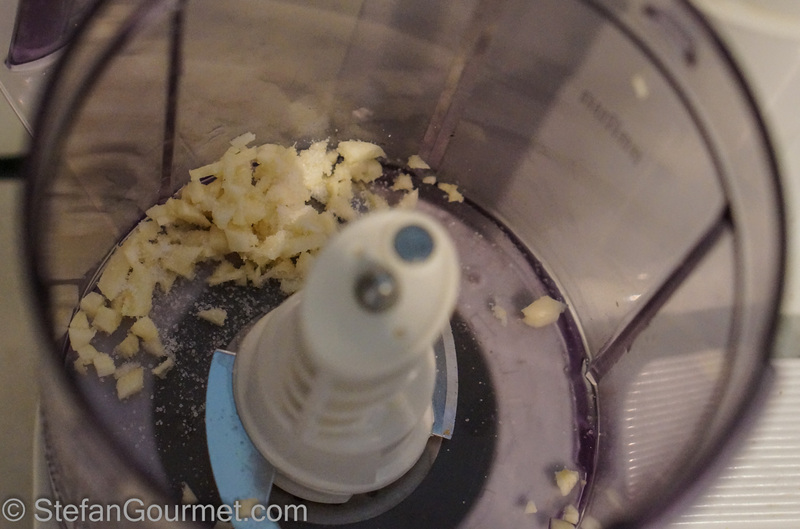 Combine the garlic and salt in the blender. Process briefly. Add the egg yolks, and process briefly again. With the motor running, add the oil very very slowly. At first, only by a single drop at a time. 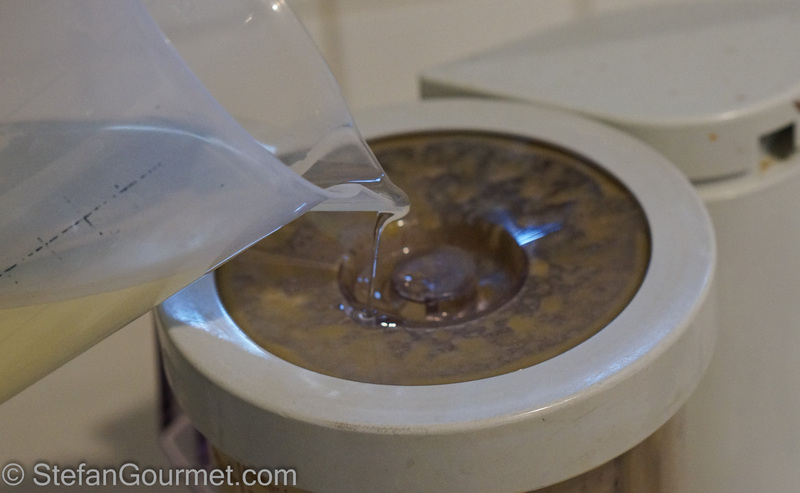 If you add oil too fast, the emulsion will break and you will have to start over. Not being the most patient person around, I’ve been there, believe me. After you’ve added all of the oil, it should look like this. 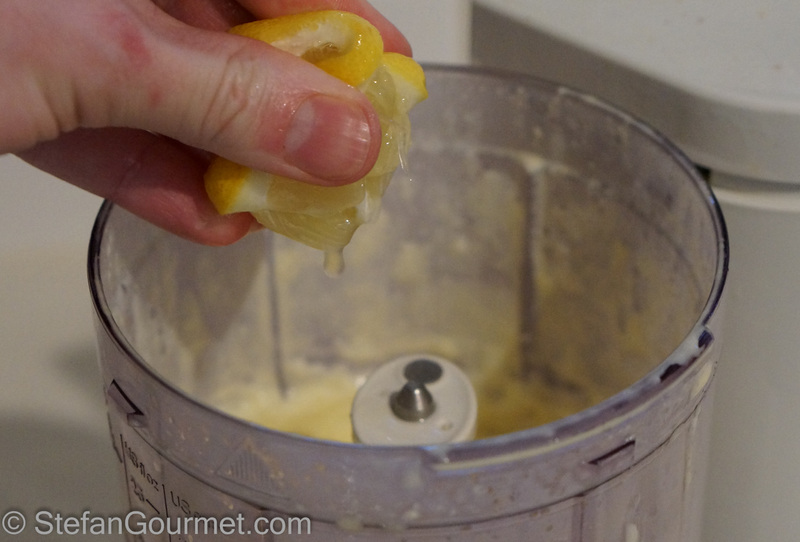 Add the lemon juice, and process briefly to incorporate. And there you have it: homemade aioli. 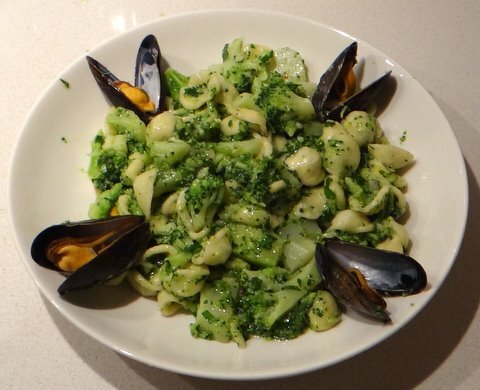 Since I started blogging there is more variety in my day-to-day cooking, but orecchiette with mussels and broccoli is so delicious that I keep preparing it regularly. It is also very healthy and takes less than half an hour to prepare. Wonderful! I now have a craving for Vlaamse Frites! Good one Stefan. I have struggled with the mayo making. This looks very straightforward. I suspect that patience is the missing ingredient in mine. Nice, Stefan. 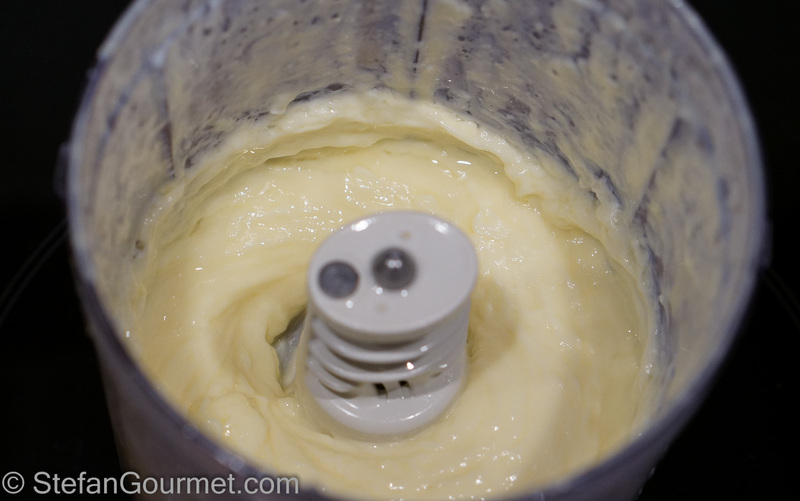 I never buy mayo; instead, we make aioli in the food processor. There is no comparison between store-bought and homemade. 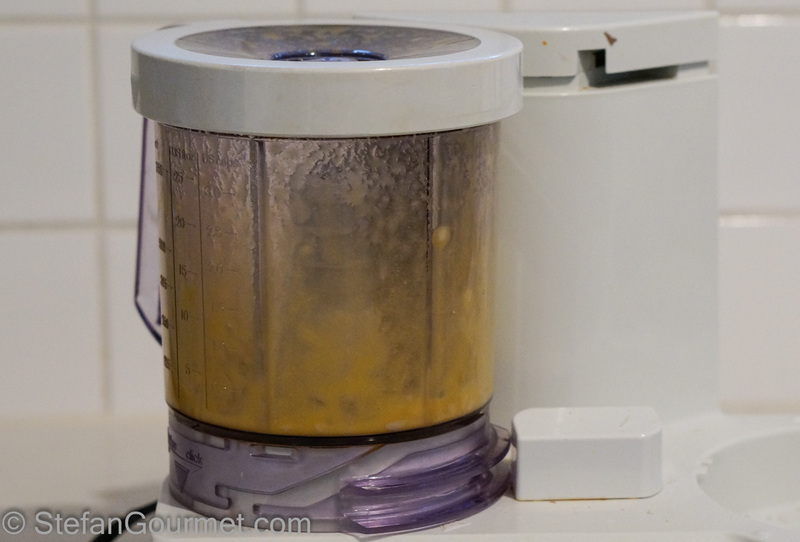 I have always used lemon zest – using the juice is a nice idea. Of course, we love using garlic! Have you ever added an herb to your aioli? Great photos! This is a traditional Spanish/Italian recipe, except for using the food processor of course. I have never seen lemon zest in mayo/aioli before, but it seems like a good idea. Garlic is my middle name. 🙂 Zest is nice in dishes where I am afraid to add an acid. Now I know I can in aioli! Es un acompañamiento perfecto para un buen pescado. Stefan ~ you have taught me two things today – I always thought aioli [quite often found in this household!] was French/Italian and whenever I saw ‘alioli’ I believed the person writing was poor at spelling 🙂 ! Would you believe regardless of perennial lack of time I still love making this by hand!! Somehow ‘therapeutic’ and relaxing . . . and I do think one gets a ‘nicer’ consistency!!!! Yum!! I’ll be this would be amazing on fish or with potatoes. This is so delicious, Stefan, though I must admit that I’ve never made it by hand. Long before I owned a food processor, I watched Julia Child make mayo in a blender. If it was good enough for her, it was good enough for me. I have upgraded to a food processor now, though. It makes homemade mayo and aioli a snap. Garlic Mayonnaise. A whisk will do the same job. I love Aioli which is well known in provencal cuisine. Awesome – I’ve always wanted to know how to make this! !